Heart disease is considered one of the world’s top killers. A paper suggests that for you to reduce the risk to the disease, one of the best things you can do is to eat fish. The risk of sudden death caused by a heart attack among male U.S. doctors was examined by the study. “Sudden death” has been defined by the research as death or collapse that occurred within an hour after the onset of symptoms, a witnessed cardiac arrest, or both. The study, which lasts for 12 months, has 20,551 participants (aged 40 to 84-year-old in 1982). A questionnaire that inquires into what fish they ate was filled out by the participants. They also had to inform the researchers how often they ate fish. There were 133 deaths by the end of 1995. Researchers have taken different factors into account and they found that those who ate fish at least once a week had 52% lower risk of dying a sudden death compared to those who ate fish less than monthly. According to the researchers, eating fish did not reduce the frequency of heart attacks, but it improved the odds of surviving such an incident. The study was part of the U.S. Physicians Health Study. Fish helps stabilize your heart’s rhythm. Researchers have linked the results to the anti-arrhythmic properties of fish. 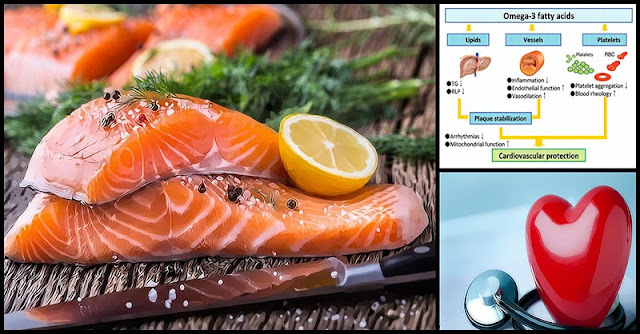 Those fatty fish like salmon and tuna are high in omega-3 fatty acids which according to studies have the ability to regulate cardiovascular function and suppress dangerous heart rhythms. Arrhythmia is a condition where your heart beats irregularly. It could beat too fast (tachycardia) or too slow (bradycardia) or it could skip a beat every now and then. Some of the factors causing this condition are stress, bad habits, and heart attack. The secrets behind the anti-arrhythmic effects of eating fish are Eicosapentaenoic acid (EPA) and docosahexaenoic acid (DHA), which both help relax the heart muscles and also reduce the risk of potentially deadly myocardial irritation. Aside from boosting cardiovascular function, omega-3 fatty acids also improve a person’s overall health. Consuming omega-3 has been linked to reduced joint pain among people with arthritis and improve the absorption of calcium, thus leading to increased bone density and lower risks of osteoporosis. Too much inflammation can lead to heart disease, cancer, and other serious conditions. Omega-3 has been associated with reductions in inflammatory chemicals, such as cytokines and eicosanoids. Consuming omega-3 helps ensure proper brain development in infants since DHA is a vital component of the brain Aside from this, fatty acids also help in managing mental disorders such as schizophreni1a, bipolar disorder, and depression. It has also been linked to a reduced risk of age-related mental decline and Alzheimer’s disease. This is mainly because of DHA, which is a structural component in the retina of the eye. By consuming foods rich in omega- fatty acids, you can lower your risk of macular degeneration which is one of the leading causes of blindness today.